Published: Dec. 9, 2018 at 07:32 p.m. Published: Dec. 9, 2018 at 06:29 p.m. The Dallas Cowboys crash the Philadelphia Eagles' celebration after wide receiver Alshon Jeffrey's touchdown. 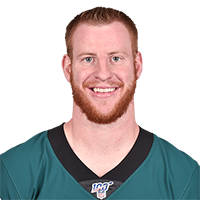 Published: Dec. 4, 2018 at 12:40 a.m.
Philadelphia Eagles quarterback Carson Wentz make a 6-yard touchdown pass to wide receiver Golden Tate.